I first threw this salad together a few years ago when I was scrambling to get a luncheon planned after I had my third baby. I needed a quick salad for a side dish and a pesto pasta salad came to mind. A short list of simple ingredients combine to create a light and perfect pasta salad. And it couldn’t be easier to make. I’ve since made it many, many times and am always pleased with how tasty and quick it is. 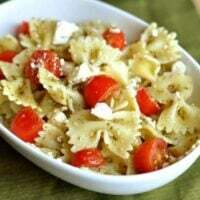 The tomatoes brighten up the fragrant basil and tender noodles and the feta cheese is lovely, as feta always is in my book. Wonderful as a side to many a meal, this would also be fantastic with some tender, grilled chicken mixed in, morphing it into a main dish salad. Cook the bowtie pasta according to package directions in a large pot of salted water. Drain the pasta and run it under cold water just until it cools slightly. Drain the pasta well. Transfer the pasta to a large serving bowl. Stir in the pesto and gently mix until the pasta is coated. Season with salt and pepper to taste (about 1/4 teaspoon each). Add the halved tomatoes and feta cheese. Toss to combine. Cover the pasta and refrigerate up to an hour before serving. If the pasta seems at all dry before serving, you can stir in the additional olive oil to moisten the pasta. I’ve made this too many times to count to take to potlucks and get togethers and every time I do, it’s a hit. And if I’m lucky there are leftovers for me to devour the next day. Yum! Thanks for this delicious recipe! How far in advance can I make this? Rachel – You can make this up to 24 hours in advance – just stir in some pesto before serving if it is dry. I’ll have to take a picture and post it this summer! I was just at our local farmers market and found the nicest-looking basil bunches (for only $2, too!) Since you are my go-to for cooking knowledge, I was wondering if you had a recipe for homemade pesto? Shelly – I love this dish for baby showers! I’m glad it was a hit. Thanks for letting me know! would lemon basil work in this recipe? I have tons in my herb garden. Loralee – to be honest, I’m not sure but it is worth a try! I have made this one over and over again after you were so kind to make it for Detmer’s blessing day. It is simple and delicious!! What a refreshing summer recipe! Such pretty colors too! quick, clean, and simple–perfect for a potluck or light lunch, for sure! Yum! This pasta looks so simple and delicious. Pesto pasta perfecto! Big YUMS!! AND, we have pesto in the freezer! I love the way bowties feel in the mouth. Beautiful photo, Melanie! I love every ingredient in this pasta, and it will be great recipe for the pesto I made and froze last week. Thanks for sharing! I make a similar meal all summer long with grilled chicken and cubes of fresh mozzarella in place of the feta. In the fall/winter when I am using up the pesto I froze in the summer, I use sundried tomatoes in place of the cherry tomatoes–it’s fantastic! We eat it hot for dinner, and cold for lunches the next day. Wow! Speaking of Pesto. I’ve made it a couple times this summer and failed to measure out what I use each and every time. Until last night. I made it and wrote it down and I finally have a recipe to email you. I love this kind of salad. Although I don’t refridgerate it. I just toss it together right before serving and keep it at room temperature. I think the flavors are better.